A single image from Pope Francis’ visit to America is seared in my mind. 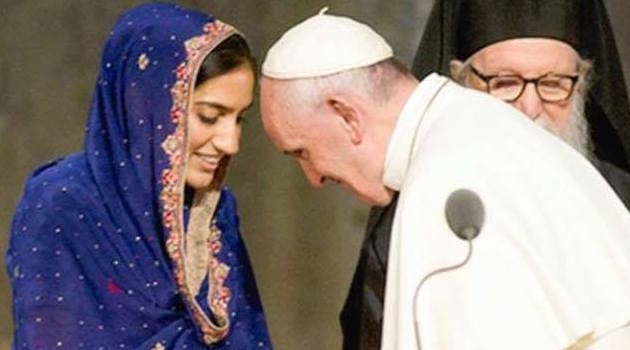 At an interfaith service at the 9/11 Memorial, the pope paused on stage when he met Gunisha Kaur — a fellow Sikh woman who has fought tirelessly for human rights and is now carrying her first child. The pope lowered his head, lifted his palms, and offered a blessing for her baby. The symbolic power of that moment brought me to tears. Here at the 9/11 Memorial — a site of horrific loss that also commenced a new era of racism and violence for Sikhs and Muslims — the pope blesses a child who will be born Sikh, who will grow up brown in America. It was as though his prayer held the promise of a new generation. A new world. A new way.He did this repeatedly. When the pope stopped his motorcade to embrace a child of immigrants, declined lunch with Congress leaders to feed the poor, or took the hands of prisoners and said, “I am here . . . as a brother, to share your situation and to make it my own,” he was showing us the new way. The Sikh faith calls it “seva” — selfless service with love at the core. That’s why I call him my beloved Sevadar, one who serves others with a warrior’s heart and a saint’s eyes. We don’t need to agree with every position to cherish him — he is truly the People’s Pope. In Pope Francis we see a master leader at work. Though he uses beloved themes, there is no stump speech, but instead, carefully nuanced, variegated messages, audience specific and pitch perfect in tone. He is power-speaking truth to power but pivots with deep attention to the faces of children, who clearly represent the face of God to him. Pope Francis inhabits his leadership and exemplifies the best of faith in public life. With an invitational and winsome style he demonstrates love that does not “insist on its own way.” And, though the pundits and even members of his own team may insist otherwise, Pope Francis’ message of justice and inclusion will become flesh in policy and culture change if we answer his call. What the Pope said was important, but how he said it was no less intriguing. Understated, disarming, gentle, and unhurried, he kept returning to certain key themes rather than mounting a linear argument that demanded submission. This indirect approach makes sense when we realize he wasn’t asking us to change an opinion or two, but rather was inviting us to change our whole way of thinking, our whole value system, our whole view of the world — from one based on money, rivalry, and greed to one based on love . . . for God, all humanity, and the earth. As a Muslim, I was deeply moved and inspired by Pope Francis’ visit to the United States. I was honored to attend an interfaith prayer service at the 9/11 Memorial Museum where he reminded us that together we are forces of reconciliation, peace, and justice. While many of our leaders, some of whom are vying to be the next president of the United States, have chosen to vilify and ostracize Muslims, the pope chose to embrace my faith community and remind people of our shared humanity.I may not agree with Pope Francis on everything, but what he has taught me is to speak about what is good, what I stand for, and what I believe in. Oftentimes as Muslims we find ourselves on the defensive and lose opportunities to share the beauty of Islam, and the pope demonstrated that we don’t have to limit ourselves to answering the ignorant, but through love and compassion we can teach the masses. Pope Francis has issued a call to action to religious leaders. These multi-faith gatherings are not just “for show,” but are driven and shaped out of a deep sense that faith, and even religion, can still make a difference. It is a call-to-action rooted in a deep understanding that fear and the negative views of our differences do not have the last word. It is a call to action that puts the spotlight on us as faith leaders and reminds us that we have the power to change things in a meaningful and powerful way if we are willing to trust the good feelings of our fellowship moments and our deep commitments to people — versus the fear that resides within our reptilian brains. I did not know how hungry I was for a leader to call for real coming together. In the congressional chamber, when Pope Francis said that his job was to be a bridge, I felt seen and nourished. Our recent Nuns on the Bus trip was all about Bridge the Divides, Transform Politics. This is the joy of the Gospel! Now we have work to do to put it into action. — Sr. Simone Campbell, NETWORK and “Nuns on the Bus”, Washington, D.C.
Pope Francis embodies the tenderness of mercy. From comforting families who lost loved ones on September 11th in New York City to proclaiming hope to the prisoners in Curran-Fromhold Correctional Facility in Philadelphia, Pope Francis has embodied God’s tender mercy. Through the visit of Pope Francis, America has been touched by the mercy of God. In grateful response, I will wake up each morning and pray for Pope Francis and the poor, seeking to be a missionary of mercy through fighting fiercely for justice for all.